Something about burlap makes me want to wear rhinestones. That’s probably pretty odd considering burlap is intended as something to hedge a garden or transport potatoes, but who am I to fight a winning combo? Sometimes opposites attract. It’s a good thing. Okay, it’s not always a good thing (remember when Lance Armstrong was dating an Olsen twin and everyone was all I AM NOT OKAY WITH THIS, MICHELLE TANNER)…yeah not like that. This is more like pretzels and ice cream. Stripes and florals. Contrast. In this case, the contrast between the scratchy burlap and the sparkly jewelry is a winner. 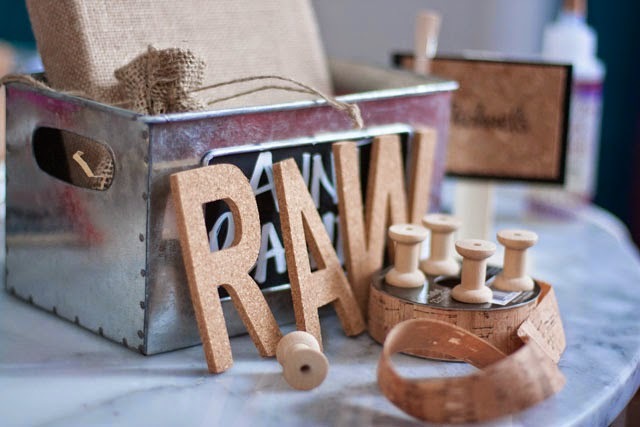 This project is brought to you courtesy of Michael’s Raw Bar, a new line of products made of materials inspired by nature; burlap, cork, chalk board, wood, metal and canvas. Rough surfaces that make a great base layer for all sorts of craft projects. Raw products will officially launch in Michael’s stores August 8. Part of the Raw line is a selection of burlap canvases in a variety of sizes, everything from teeny tiny to extra large. Part of me wants to buy ten of them and grid them up as a headboard, but for now I’ll keep it small and dainty. A dainty place to hang my sparkles. Want to make one for yourself? Let’s go! Hooks: Adding cuphooks is easy because the wood is fairly soft, so I didn’t even need starter holes. I just set the point of the screw on spot then hit the back of the hook with a hammer to get it going, then twist, twist, twist, Bam. Repeat. 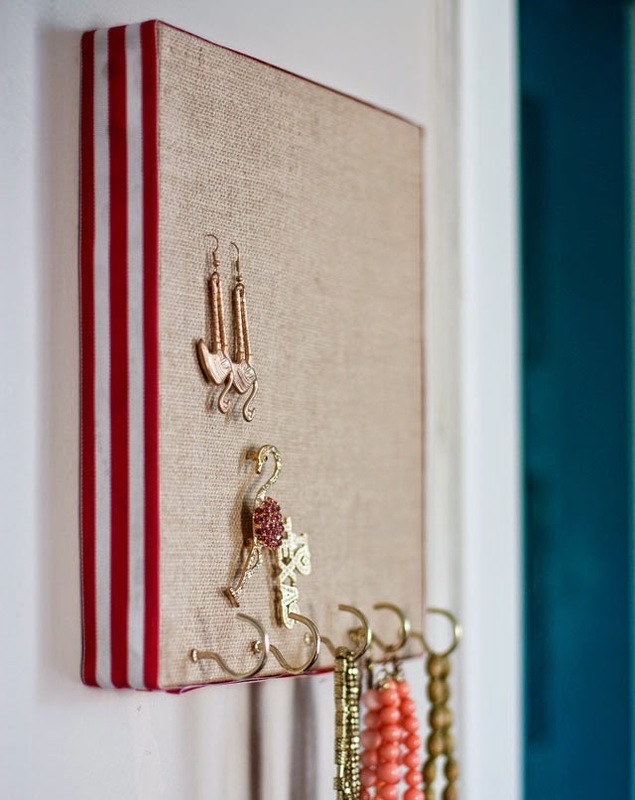 You could add hooks or nails along the upper edges of the canvas for bracelets, too, if you like. Ribbon Edging: You know that single yard of amazing grosgrain ribbon you have been hoarding on a spool in a drawer for 3 years? Yeah. That one. Get it out and glue it to the edge of this frame. Now it will be on display year round where you can appreciate it every day. I recommend fabric glue instead of hot glue for this project, as hot glue will eventually dry out when used on super porous surfaces (like burlap), and it can get lumpy and make the ribbon not look so cute. Doesn’t your ribbon deserve to be cute? Now just add jewelry until your heart is content. Again, the great thing about the burlap is the weave — it’s loose enough that it’s perfect for hanging dangly earrings (no starter holes required) but tight enough to hold on to a hefty brooch. 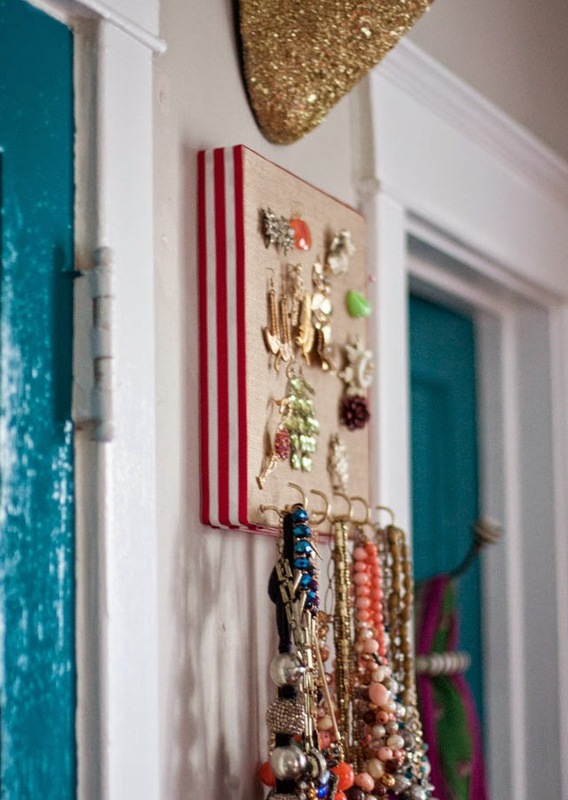 The wooden frame is impressively thick, so not only can you add a few cuphooks, you can hang some seriously heavy necklaces. Note my homemade flamingo earrings courtesy of my pal Michelle. Can you guess what they are made from? PS: Click here and get 25% off your entire purchase from Michaels (including sale items) with code SALE25A. Free shipping on orders over $50. Y’all. That’s a lot of ribbon. First of all, Raw Bar is the coolest name for a craft line I have ever heard. Second of all, I have had that same exact piece of ribbon in my drawer for three years, how does this happen? Third, ooh, those earrings, they are still in your collection! Yay! (But isn’t one of them backwards? Did I do that? They should be pointing in opposite directions. I noodge because I care. Also I have symmetry OCD.) 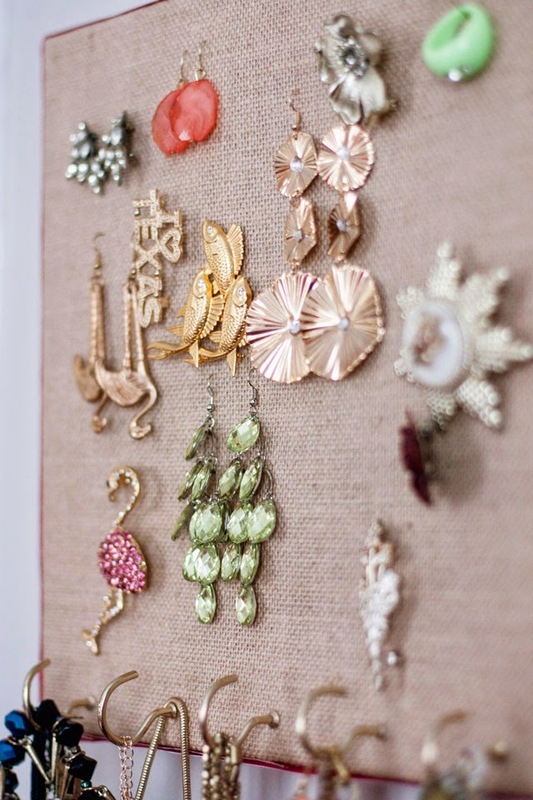 Fourth, that is such a chic idea for a display, love how the neutral background lets the baubles stand out. — the fault is probably mine — I think I inserted them in the canvas the wrong way. They dangle beautifully! I can’t wait to try this! I have an old, drippy ornate frame that a friend of mine pulled out of someone’s garbage and she gave it to me to do something with. I think adding burlap to it is going to be fabulous!!! Thanks for the great ideas! What a great idea! 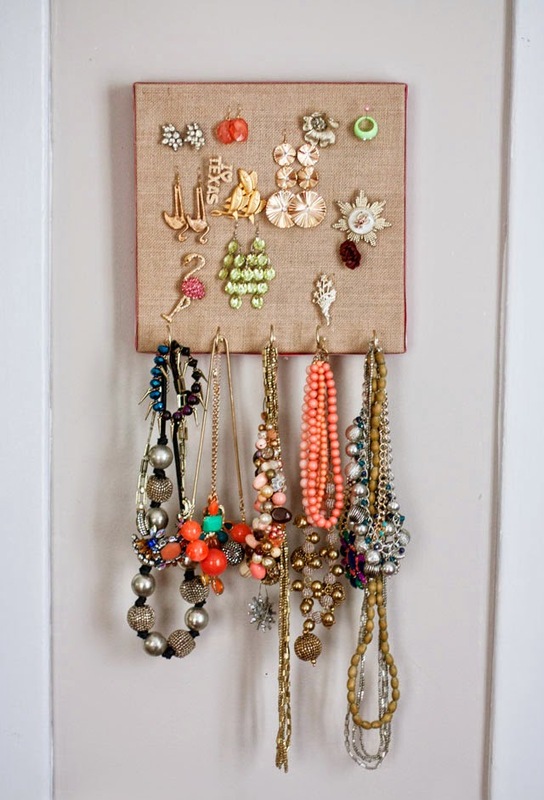 I never know, where to but all my jewelry (maybe I just have too many:D) I will definitely try it with this organizer. You got some beautiful earrings there:) Thanks for sharing!